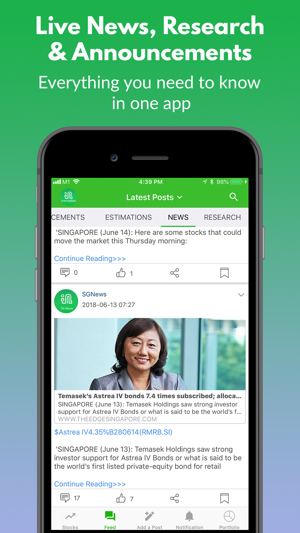 InvestingNote is Singapore’s first and largest social network that empowers investors to share, learn and connect with better investors. 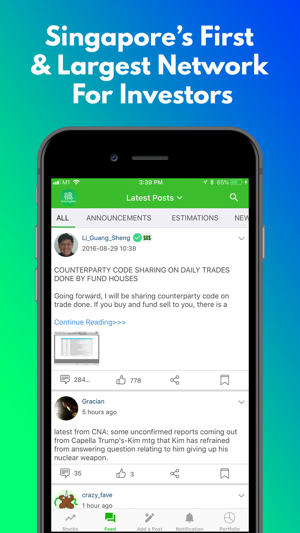 This works similar to a traditional stock forum – presented in modern, engaging and Facebook-style live feed. You will know exactly what's Hot and what's not in the market as an investor! Harness the power of thousands of investors and experience first-hand how it can help an investor like yourself - whether you’re a veteran with years of investing experience or total newbie. Tap on the wisdom of the crowd for better investing and trading outcomes. Their knowledge, Your gain! 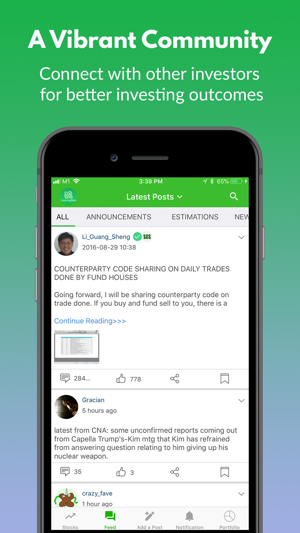 Join InvestingNote to keep yourself updated with the market and stay connected to a very welcoming community of investors! • The platform with the largest community of investors and traders in Singapore. 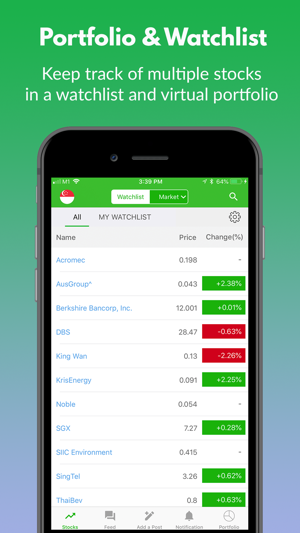 Thousands of investors are giving their investing ideas about the latest trends in the stock market daily. See what’s the next big investing idea other investors are looking at today and act on it fast! • Users gain reputation and ranking through the contribution of quality content and engagement. See what other investors are saying and learn from the best! • Professional investors & verified institutions are part of the community. Never worry about credibility again - identify them by their verified badges! • Know the social sentiments of a stock’s price by looking at estimations – see whether other investors are bullish or bearish on your favourite stock! • The most updated news and information to keep you in touch with the market. The latest research reports are shared for every stock. Get news on what’s happening in the world, its impact on the stock market and see how other investors are reacting. Be amongst the first to anticipate changes. 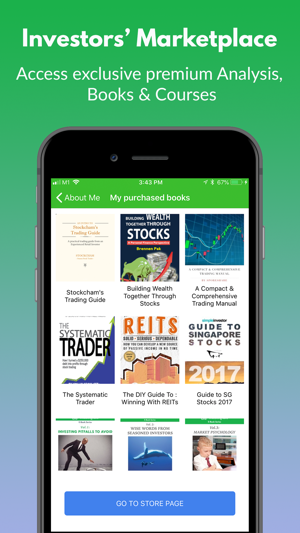 • Access premium and exclusive analysis and insights from veteran and professional investors. Follow and learn the way they pick their stocks! • Track your own virtual portfolio that does not require any funds. Say goodbye to troublesome ibanking OTPs! 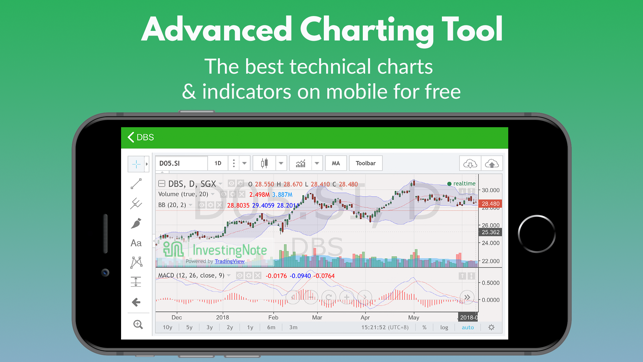 • Watch SGX stocks like Capitaland(C31), SIA(C6L), Singtel(Z74), DBS(D05), etc. • S&P 500 stocks like Facebook Inc. (FB), Apple Inc. (AAPL), Tesla (TSLA), Nike (NKE), Netflix (NFLX), etc. • Implementation of the data of major Forex markets such as EUR/USD, USD/JPY, USD/CAD, USD/CHF, USD/HKD, GBP/USD, EUR/CHF, AUD/USD etc. Users will be able to trade currency pairs and even alert them on major news such as the changes of interest rates. • Including major crypto-currency such as Bitcoin (BTC), Ethereum (ETH), Ripple (XRP), Bitcoin Cash (BCH), Litecoin (LTC), IOTA (MIOTA) , Dash ,NEO ,Monero (XMR), EOS, Ethereum Classic (ETC) and many more. Crypto-currency is the birth of a new era and age for payment methods as well as alternative asset investments. Great app to use! Especially being a beginner investor myself. A community that guides you along through answering you queries and time to time professional investors will share ideas and come up with articles to share with the community. 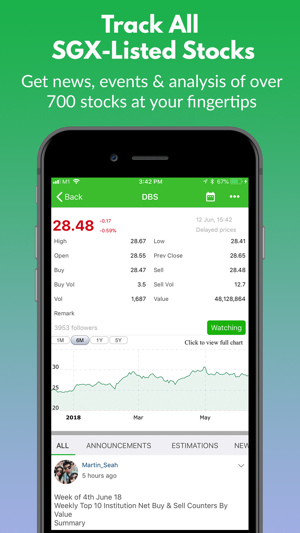 This is my one-stop app for daily doses of finance news, views from people (DYODD as always) and company updates. One word - amazing. Been a fan since thr app first started, and I have never looked back since. Should make it Ipad pro compatible. Reading this on a 12.9” tablet is rather annoying especially, when you can’t view in landscape. Overall great app.